So my trip to Walgreens today was really small. They didn’t have any of the free NYC nail polish, poise products, or cat food that I had free product coupons for. They only had 2 Good n Natural bars so I wasn’t able to use all of those free product coupons either but I did at least get two for free. 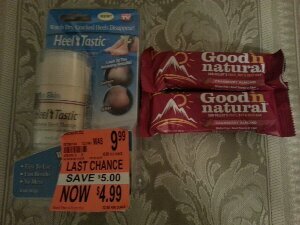 I was also excited when I found the Heel Tastic product on sale for 50% off. I wanted to buy one in the past but I thought that $10 was too much. I actually had the exact idea for this product about a month before I saw it in a store. I guess now I’ll see if it actually works. ← Don’t Forget to Use These Free Product Coupons Before They Expire!